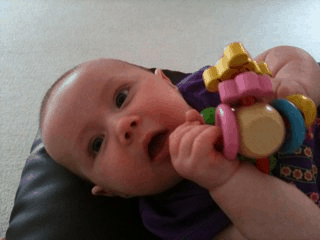 If your baby is showing at least three of the above signs then you can say with a fair amount of certainty that it is likely to be teething pain that is the problem. Many parents will notice a few more unusual signs every time their baby is about to cut a tooth, e.g., they always develop a cold, but I have tried to stick to the more common signs above that are normal in the majority of babies. Please note. If she seems in pain but doesn't show any of the above symptoms as well, then I would recommend that you talk to your GP for more advice. A baby who is teething will not self-soothe or calm herself down until the pain has stopped. If it happens during the night she will wake repeatedly crying. She may settle initially with a cuddle if it is just mild teething pain, but will likely be unsettled and wake on and off all night. With more severe pain she will be almost hysterical, and crying even when comforted. Most adults will have experienced toothache or pain when wisdom teeth are having a ‘rumble’ for a few days and trying to push through the gums. 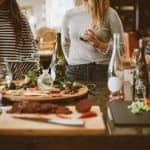 It can even put you off eating because your mouth is so sore – but at least we understand what is going on and can self-medicate accordingly. A baby has no idea what is happening and the only way to let their parent know is to cry. Unfortunately, teething is one of those things that goes on for months, sometimes without any results. 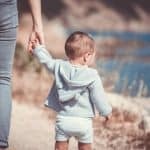 Symptoms can begin from the age of eight to ten weeks, although some babies have been known to be born with teeth or get a couple very early on! 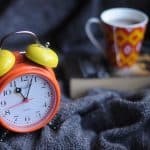 For the majority, teeth can take a very long time to appear. They rumble in the gums gradually pushing their way up before ‘erupting’ (aptly named by dentists), and ‘cutting’ through the gum so that you can finally feel the sharp tip and see it. It’s normal for a baby to suffer with teething pain for two to three days and show various signs above, and then be fine again for a few weeks. 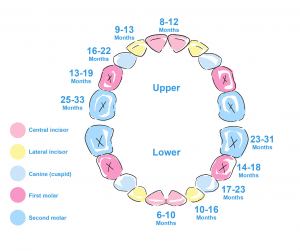 Babies vary at the age and order in which teeth erupt in their mouth. Here is a diagram to give you a rough idea of when to expect things. However, please do not panic if your baby doesn't fit in with ‘the norms’ above. None of my three children have conformed to this diagram, and the same goes for many other babies. It is just a rough guide. 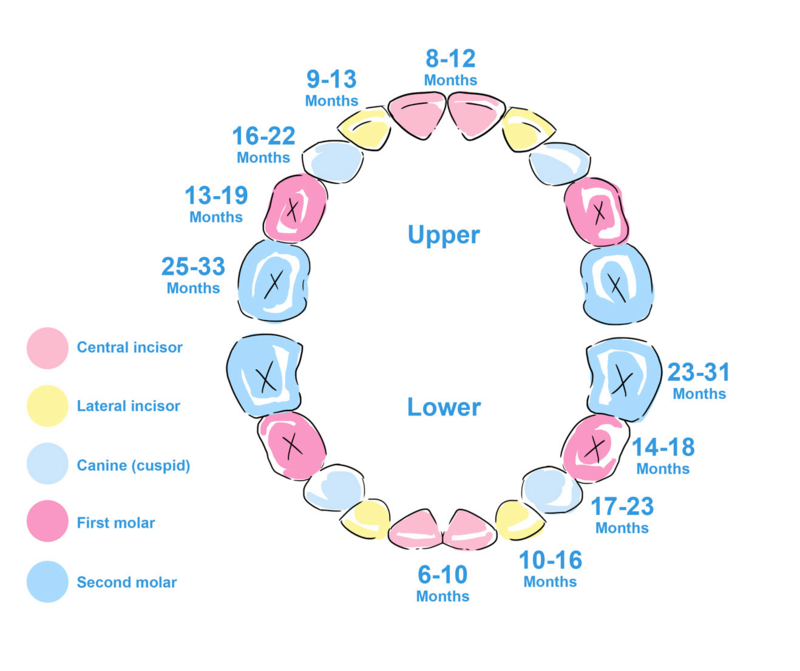 My first son got a top tooth, then a bottom side tooth, then a top side and then a bottom front, all within the space of 4 weeks, between the ages of 11–12 months. My second son was different again – he was completely gummy until almost 14 months. I thought he would never get teeth! My daughter got her bottom two incisors then the top four incisors and then her four molars. We were still waiting for her lateral incisors at 18 months! All teeth arrive eventually in their own order, in their own time. It feels like a long haul as you and she are dealing with all the pain and symptoms, but you get there in the end! 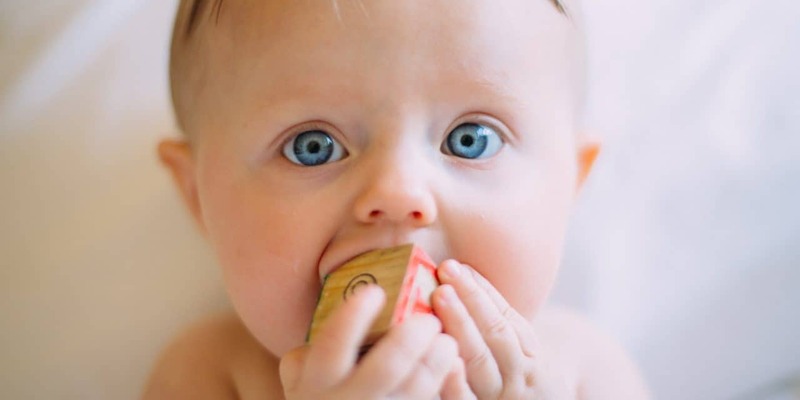 There are various gels, liquids, powders and teething products on the market, as well as necklaces containing particular ingredients, all claiming to be the best to help with teething pain. In my experience, after trying a number of different products with my own three children, babies I've worked with and chatting to other mums, I have found the most helpful and soothing product to be a teething liquid called Anbesol. It’s also sold in gel form too, but I've found that like other gels it slips off the gums and around the mouth as you are attempting to apply it. This means that you don’t really get enough of it on to the gums to relieve the pain. The liquid is much more effective because you can apply it directly along your baby’s top and bottom gums using a clean fingertip. It contains an antiseptic ingredient as well as an anesthetic so it brings instant relief. In using this product I have noticed that it has worked to relieve the pain, whereas if I had been using something else that wasn't as effective, I would have had to resort to giving infant Paracetamol or Nurofen to relieve the pain. Although it is perfectly safe to use products like baby Calpol and Nurofen for pain once your baby is over 8–12 weeks, you must ensure you read the packaging correctly so as not to go over the recommended daily dose. The Anbesol liquid is so good that if you find that it isn’t working on relieving the pain and your baby continues to be distressed, then Calpol or Nurofen is your final option. I personally find Calpol good for relieving mild temperatures and mild teething pain. However, when the pain is very severe, only Nurofen or other ibruprofen based medicines would work on my babies. It takes 20 minutes to get to work and after that they are pain free and a much happier baby. Once you have eliminated her pain, then you can attempt to get her to calm down and settle back to sleep (if at night). Is it a specific children’s anbesol or just the over the counter one that adults can also use? The reference to calpol/ibuprofen losing effectiveness through use, this is incorrect. Overuse (and incorrect use) can be dangerous but if you follow the guidelines on the packet, it won’t lose effectiveness. Please amend your article as this is incorrect and you are misleading your readers. Hi my son is 17 weeks and has recently over the past few days/nights had a cold & frequent bouts of upset where I often can’t settle him for some time. He’s been dribbling & chomping in his fist for several weeks and although he has previously always been an “every 3-4 days” baby poo wise he has become more regular & much looser. He’s also been very grizzly throughout the day & waking frequently in the night. Thank you Lisa this is a very helpful article. When my daughter was teething she was beside herself with the pain. She was very difficult to console at night time. The only way we could help was with distracting her by playing with her. Thanks for the tips Lisa. Do you have any advice on getting Calprofen into a baby that goes ballistic at the sight of it and just spits it all out? My little one loves a stick of cold celery from the fridge! My lb definitely does not fit the normal schedule then. First tooth at 8 weeks was a molar then today at 15 weeks I discover another 3 all molars. That explains the rivers full of dribble the past week. I have been facing a similar problem since last 3-4 days. My 18 weeks old baby boy is crying hysterically. Thanks for the advice. I’ll try Anbesol Liquid and’ll let you know about the results. oh my goodness, our poor little 3 month paulina is hysterical with pain. we give her tempra tylenol. it is heartbreaking to watch her screeching hysterically.